Average people whine and complain about their circumstances and try to wish away their daily challenges. 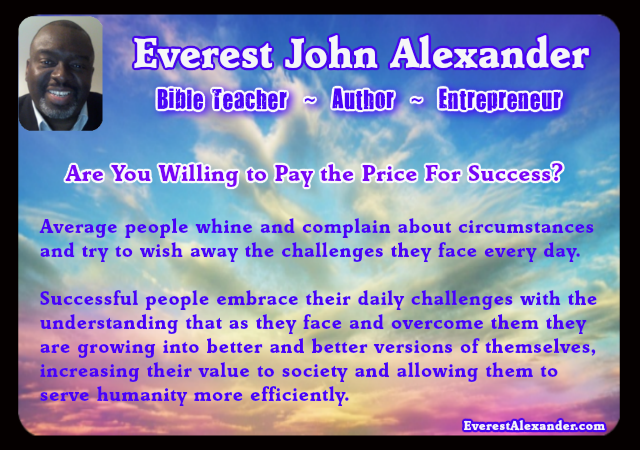 Successful people embrace the difficulties of life with the understanding that as they face and overcome each challenge they are being forced to grow into a better and better version of themselves and in so doing they are able to more efficiently serve humanity with their gifts. This process allows them to become more valuable to society and the more valuable to society you become the more your income grows. 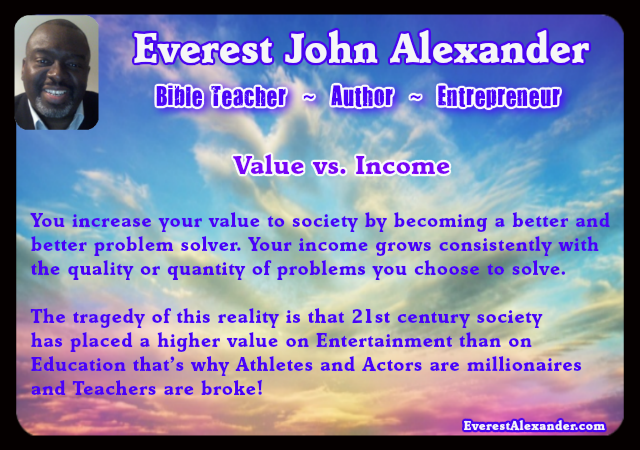 You increase your value to society by becoming a better and better problem solver and your income grows consistently with the quality or quantity of problems you choose to solve. The tragedy of this reality is that 21st century society has placed a higher value on Entertainment than on Education that’s why Athletes and Actors are millionaires and Teachers are broke! So how should the wise person relate to this information? Start by figuring out where society places their highest value and which problems pay you the most money to solve. For instance, solving medical and legal problems are of very high value so generally speaking Doctors and Lawyers make a lot of money. The problem is, there is an extremely high price to pay to become a Doctor or Lawyer, so where does that leave the average person with beyond average dreams? Remember, income grows consistently with the quality or quantity of problems you choose to solve… Quality OR Quantity! Lawyers and Doctors earn a lot because of the QUALITY of problems they solve. If becoming a Doctor or Lawyer is too expensive a price to pay, then you need to find a problem in large enough QUANTITY so that a lot of people will pay you to solve it. Ask yourself this question… What problem exists in a very large quantity that I can learn to solve without having to pay too high a price to get started? Think about it… everyone needs or wants more money. Even those who are already financially well off by society’s standards still desire more money. So, what if you could solve people’s financial problems? What if you could show a lot of people a way to earn more money with very low risk to themselves? Would THAT pay YOU a lot? Dexter and Birdie Yager are the highest paid Network Marketers in the world, earning $1.3 million dollars every month! That’s great news but here’s the interesting thing, they earn this because they have built the most successful Network Marketing organization in the history of the world. Their team spans more than 40 countries with over 1 million Distributor/Partners. In other words, they are currently helping over one million people achieve financial freedom… THAT’S WHY THEY ARE PAID SO WELL!!! They have found a problem that everyone needs solving and have become experts at solving it. That’s the Essence of Network Marketing… helping as many people as you can, solve their financial problem. This is something YOU can learn to do. The Network Marketing Industry is an open playing field for anyone to succeed. ← Does Your Behavior OR Your Belief Make You a “Good Person”?